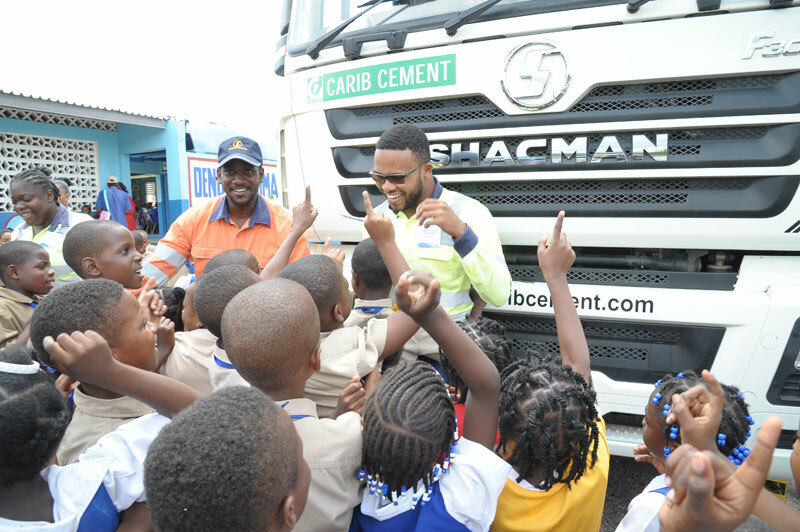 One thousand students are now better able to identify and avoid unsafe situations on the roads following the Caribbean Cement Company Ltd’s visits to three primary schools in Clarendon on Tuesday. The Carib Cement team visited Cross Primary and Infant School, Hazard Primary and Denbigh Primary School in Clarendon as part of the CEMEX Global Supply Chain Vulnerable Road Users safety programme. Carib Cement is a member of the CEMEX group. Cross Primary was selected following the tragic death of Aldriana Rowe who was hit by a truck along the Bustamante Highway while on her way home from Cross Primary in February. The safety exercise included an informative and interactive talk by the Road Safety Unit of the Ministry of Transport and Works along with demonstration of blind sides of a truck by Carib Cement. “Safety is embedded in our company’s culture and reinforced continuously. Our Vulnerable Road Users programme is multi-pronged and promotes awareness from both the perspective of the driver and the road user. 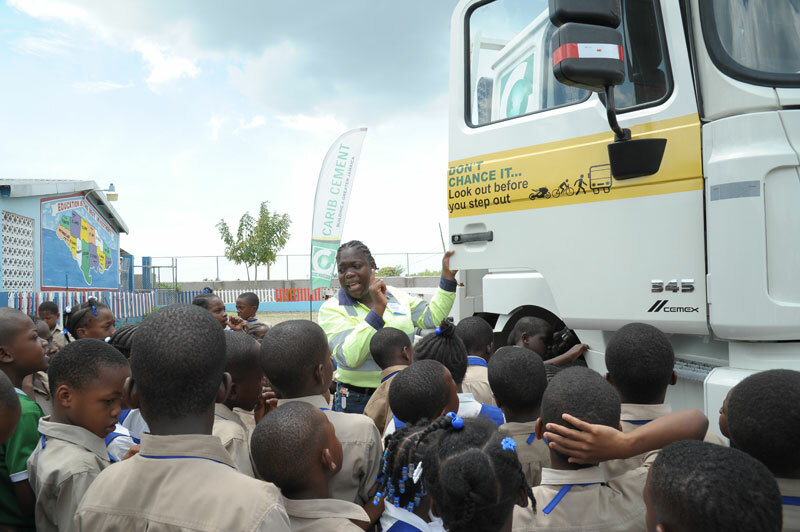 We conduct driving school for truck drivers, which includes awareness of children and other vulnerable road users and we also educate children about trucks and road hazards,” said Klao Bell-Lewis, Head of Communications and Community Outreach at Carib Cement. As part of the activities, the students learned about: crossing the street, using the pedestrian crossing and raising their hands to attract the attention of drivers. Additionally, they learned that the front, back and both sides of a truck are blind spots to the driver and areas which should be avoided. The children are also allowed to sit in the driver’s and pedestrian sides to gain perspective on the blind spots from the cabin. “We welcome this exercise, as it reinforces the road safety component of the curriculum. 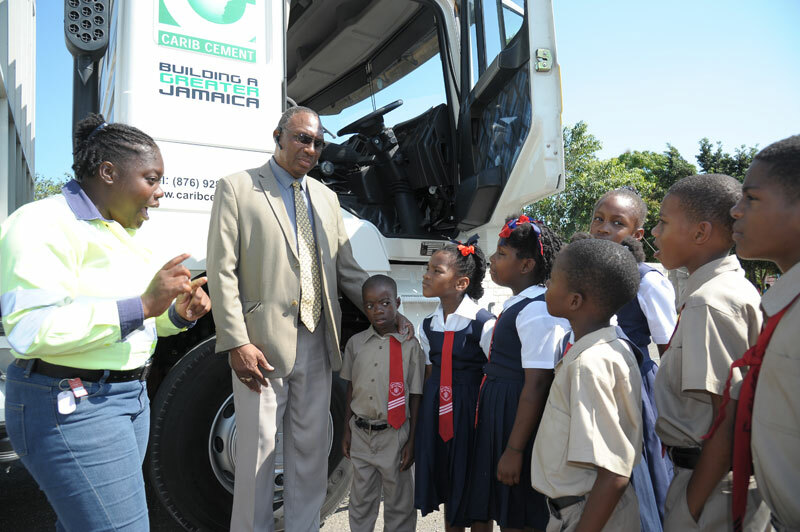 What works well is that the children are able interact with a truck and see the blind spots for themselves,” said Henry Mullings, principal of Cross Primary.